Cloud Mouth Nic Salts - Pinky 30mLDelightfully sweet Honeydew paired perfectly with Watermelon.VG/PG.. Cloud Mouth Nic Salts - Spoon 30mLFruit cereal topped with fresh Milk.VG/PG: 50/50Available in 35mg .. 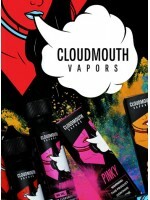 Cloud Mouth Nic Salts - Ruby 30mLSmooth Strawberry Kiwi hard candy.VG/PG: 50/50Available in 35mg and.. Cloud Mouth Nic Salts - More Please 30mLMouth watering Raspberry confection.VG/PG: 50/50Available in..